Dental sealants are solid barriers between your children’s teeth and the bacteria and acids that cause cavities or tooth decay. The hygienist can apply sealants in just a matter of minutes, but the protection can last for several years. There is no need to schedule a special appointment for dental sealants. 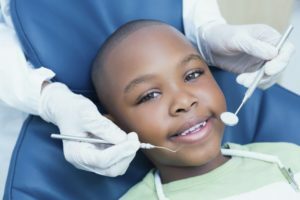 At the conclusion of one of your child’s regular dental checkups is the best time for application, because teeth must be cleaned first anyway. Then, a mild abrasive is applied and rinsed away. The teeth are dried and the sealant solution is painted on to the chewing surfaces. A curing light is used to speed the hardening process. Typically, dental sealants last for up to 10 years. Your dentist will check for chipping or unusual wear during your child’s six-month dental checkups. If any are not intact, they can be replaced as necessary. In addition to applying dental sealants to your children’s teeth, there are a few other steps you as a parent can take to help fight the battle against cavities. If your baby uses a pacifier, never use your own mouth to wipe it clean. Doing so only transfers the germs in your mouth to your child’s. This can be the beginning of a colony of decay-causing bacteria. Teach your children how to brush. Choose a soft toothbrush and fluoride toothpaste. Brushing should happen twice every day for two minutes at a time. Be sure to help your children brush until they are seven or eight years old. Flossing should begin once your baby has two teeth that are touching. This preventive measure helps to remove bacterial plaque and debris from between teeth and along the gum line. Give your children a well-balanced diet that includes fresh produce, lean meats, chicken and fish, and whole grains. Limit snacks between meals. Schedule regular dental checkups with the children’s dentist in Springfield every six months.